Whenever Matt Bianchini brings his bright yellow .243 Ackley to the firing line, heads turn. This is one truly handsome rig--as good-looking as it is accurate. Built to smoke varmints at long-range as well as compete in 1000-yard benchrest matches, this rifle is proof that competition improves the breed. Fitted with a Farley action, Jewell trigger, Leupold LRT scope, and Lilja or Krieger barrel, the Yellow Ackley is a "no compromise" match rifle that can run with the big dogs in 1K Benchrest competition. And with the Ackley's ability to toss 106gr Clinch Rivers at 3350 fps, this is one flat-shooting, hard-hitting varmint rifle. Matt's show-stopping rifle is a .243 Ackley Improved (40-degree shoulder, .271" neck), chambered with a Manson reamer. On top the stainless Farley "S" action, in Farley 30mm rings, sits a Leupold LRT (1/16 MOA dot) boosted to 18X-40X by Premier Reticles. Matt has 6 barrels for the gun, three Lilja 3-grooves, a couple Kriegers, and a Shilen. Matt's gun currently sports an 8-twist 29" Lilja 3-groove HV taper that Matt says cleans up like a dream. The stock is a Shehane ST-1000 Tracker made in fiberglass by McMillan, with a BAT trigger guard and Shehane polished billet aluminum buttplate. Prior to final finishing, Matt worked over the flats and some of the angles. 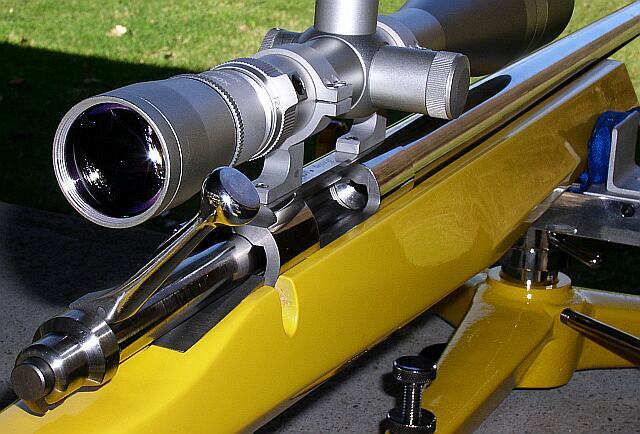 That's why the facets are so well-defined on this rifle compared to some 'glass Trackers you may have seen. The gun was chambered by Dave Bruno of Cheswick, PA, and Matt did all the stock-work himself, including the Sikken "Viper" yellow paint job--but more about that later. The heart of Matt's rifle is a Farley action. Farleys have found favor with top point-blank Benchrest competitors, because the bolt can be worked so fast. And the Farley is as smooth as it is speedy. The difference is quite noticeable if you compare it to a blue-printed Rem 700, or even a recent Stolle Panda. Farleys are true customs, built one at a time by the Farley family in Oklahoma. Unlike a BAT which is machined from billet steel, a Farley starts with a stainless investment casting, much like Ruger pistol frames. It uses a cone bolt for smooth, yet solid lock-up. One of the unique features of the Farley is the ejector--it can be switched on or off, depending on the shooter's preference. So, if you're load testing some hot rounds, you can turn the ejector off. In a match you can turn the ejector "on" to function normally. Matt is now a confirmed Farley fanatic. He tells us: "I've got quite a few other very nice actions, including Nesikas. But none of them are as slick as that Farley. When you work the bolt it feels like it's on ball-bearings. And you know, a lot of people have tried to buy this action off me. And they've offered more than I paid for it. But it will never be for sale." That flawless, smooth-as-glass Screamin' Yellow finish is no ordinary paint-job, but then Matt Bianchini is no ordinary do-it-yourself painter. His family runs an automotive body-shop, so he had access to premium paints and a quarter-million-dollar spray booth with all the latest technology. Still, Matt spent many hours on this stock to get everything right, trying a couple colors before he settled on a Sikken automotive "Viper Race Yellow" formulated for the Dodge Viper sports car. After careful prep work, Matt sprayed two coats of Viper Yellow, and then added three coats of high-grade automotive clear, which was then baked-on in a heat chamber. Matt also painted the Sinclair front rest to match the stock, and even polished the surfaces of the Hoehn windage top. A lot of effort, Matt told us, was required to achieve the results you see here. Though Matt's Ackley has harvested its share of varmints, the gun was built with 1000-yard benchrest competition in mind. At left is the firing line at Thunder Valley, Ohio. Yep those targets (upper right) are 1000 yards away. Now you know why Matt has a 40-power scope. 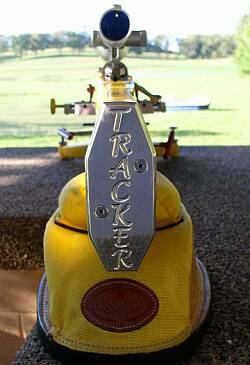 The Yellow Ackley weighs just under 17 pounds to meet IBS and NBRSA "Light Gun" weight limits. While Matt says his bullets don't "go to sleep" for a couple hundred yards, this gun can still shoot 1/4" groups at 100 yards and hold that accuracy much, much farther. 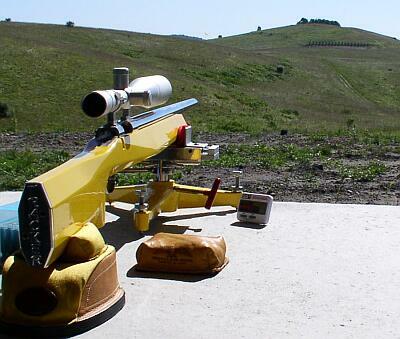 Matt reports, "my best-ever group was five shots in .397" at 400 yards. Yep, I got lucky with the conditions, but this is a very accurate rifle." Matt loads 106gr Clinch Rivers with 47.5gr of Reloader 25 for his Krieger barrels, a little more powder with the Lilja 3-grooves. 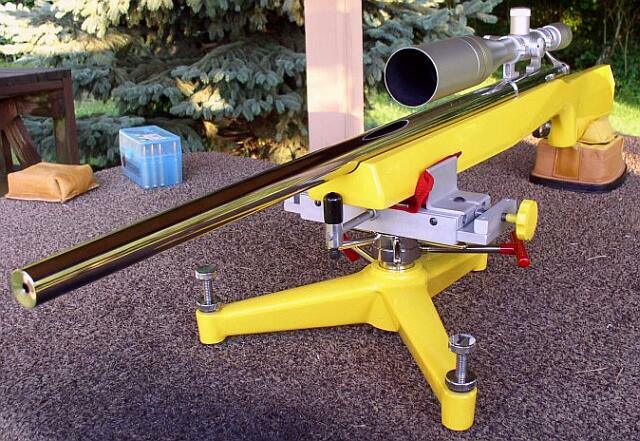 The Lilja load runs 3342 fps, with a 3.228" OAL. Cases are neck-turned Lapua .243 Win-chester. He uses Wilson seater and neck-sizer dies (.267" bushing), and a custom, reamer-cut FL sizing die. While Matt has a big stable of varmint rifles, the Yellow Ackley has seen plenty of duty in the 'Hog fields. Matt is from a farming family and he can shoot practically right out his back door (see top photo at the farm). He has nailed some big ground-hogs at 800m and beyond. 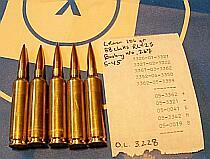 The .243 AI does kick a bit compared to other varmint cartridges, but even with 105-106gr bullets, it's not bad. He might add a muzzle brake at some point, just so he can see impacts better. Check out Matt's personal web page for photos of his varmint shoots. 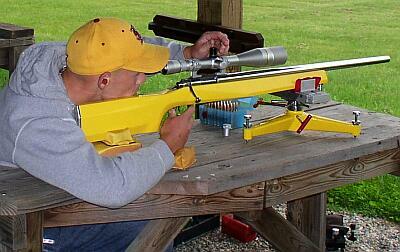 Screamin' Yellow 6mm Dasher?Matt originally thought of building the gun up as a 6BR or a 6BR Improved. He has a Manson reamer similar to a 6mm Dasher, with a 40-degree shoulder and .008" body taper. He actually chambered a couple barrels with that 6BR Improved reamer, but he hasn't shot them yet. He was so pleased with how the gun performed in .243 AI, that he saw no reason to change. And it may be a while before he slaps a Dasher-chambered barrel on the rig: "I really like the way it shoots as a .243 AI. I'm so impressed with it that I don't want to mess with anything. And I don't think I'll be running out of Ackley barrels anytime soon." Photos Copyright © 2004, Matt Bianchini, All Rights Reserved. All other content Copyright © 2005, 6mmBR.com, All Rights Reserved. No reproduction of any content without advanced permission in writing. Topics: .243 Winchester, .243 Ackley, .243 AI, Lilja, Krieger, Shilen, 1000 yards, IBS, NBRSA, Varmint, Varminting, Improved cartridge, Jewell trigger, Benchrest, BR, Bench Rest, Single-shot, competition, rifle accuracy, 6mm, 6PPC, 6mmBR, 6BR, Norma, Alliant Powder, Reloader 25, RL25, Tracker, ST1000, Shehane stocks, McMillan, Farley Action, stainless barrel, reloading, powder selection, case forming, Neck-turning, .271, Redding Bushing, .267, Lapua Brass, Clinch River bullets, precision, Farley CoAxial.